Originally posted on KyWilderness.com in July 2014. 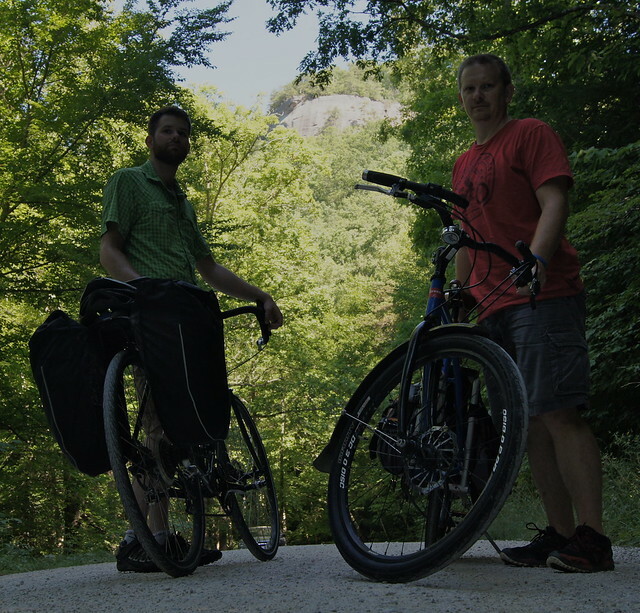 After months of talking about it, my friend Chris and I finally biked down to the Red River Gorge from Stanton for a day of climbing. We had our sights set on "Big Country" a three-pitch, 5.5 trad climb with nice exposure and a great view at the top. We left Stanton at about 8:30 on Saturday morning, under unbelievably pleasant conditions, and pedaled along on approximately 15 miles of scenic and sparsely-trafficked backroads to reach the approach trail for Long Wall, a climbing area between Indian Creek and the middle Red River Gorge area. Note: All photos by Chris Chaney except the one of the bike/gear which was taken by the author. All the necessary gear for a day of climbing easily fit in the panniers on my bike. A few miles away from our destination, on a low-traffic road that parallels the north fork of the Red River. Getting ready to park the bikes and hike up the steep approach trail. We would climb a route on the cliff visible in the background. I'm in the green shirt. We pushed our bikes up the trail a few hundred feet (and on a steep trail like the approach to Long Wall, a few hundred feet seemed miserably far) to get them out of sight of the road and then sorted gear, threw on our backpacks and headed for the base of the cliff. The last bit of the trail was relatively faint, but Chris was familiar with the area and the route (he'd climbed it several dozen times) and we arrived at the base of the climb at around 10:30. Chris led each pitch (section) of the climb, placing traditional pieces of climbing protection in cracks along the way, slinging rhodo clumps and small pines, and setting up the belay stations. 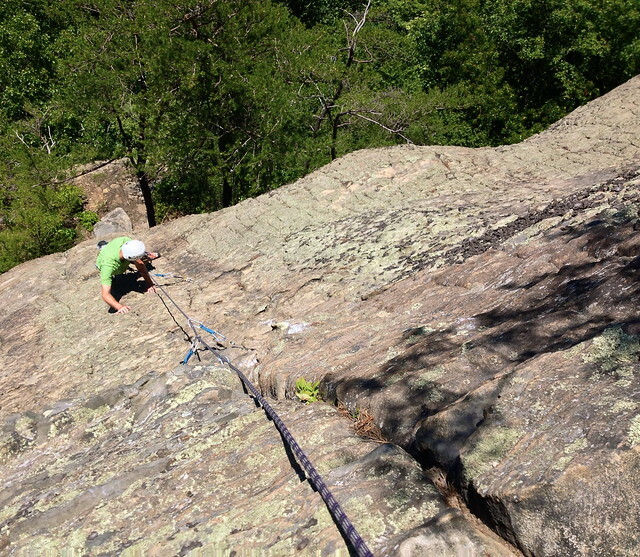 All I had to do was belay and then follow the rope while removing the protection he had placed on his way up. In other words, Chris did all the hard work and I was just along for the ride. Belay ledge for the last pitch. The view from here was great, but the top-out view is even better. 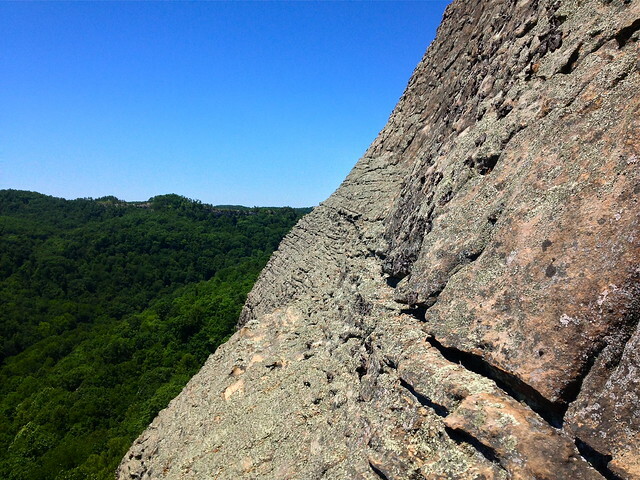 Background view from the belay ledge. The Red River and the gravel road are visible below. Climbing up the last pitch. View from midway up the last pitch of climbing. Auxier Ridge is visible in the distance. We soaked up the view from the top for several minutes, but didn't linger terribly long. We were both getting thirsty (water was at the base of the cliff with our packs) and were looking forward to being back in the shade after climbing in the sun for nearly two hours. 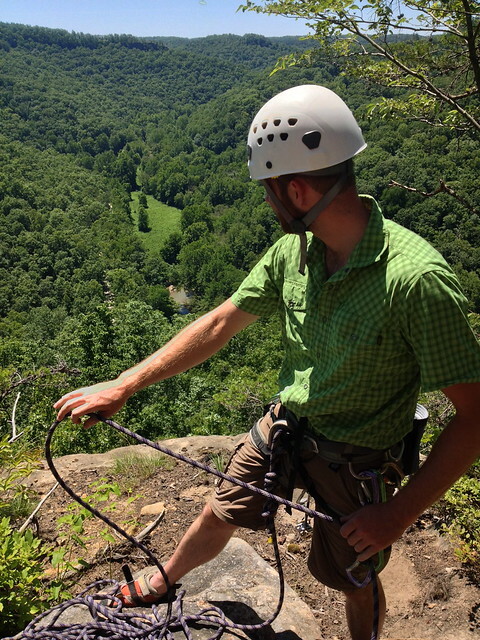 We were able to reach the ground by rappelling from the top of the climb down to one of the lower belay stations. It was a relatively simple descent, with a bit of traversing here and there, except that there was a somewhat dense section of canopy between the cliff and the ground that we had to rappel through; the optimist in me says we got a free canopy tour, the pessimist in me wishes I'd worn pants instead of shorts. We made the downhill hike to our bikes in good time, wheeled them back down the trail to the road and began the ride home along a narrow road shaded from the mid-afternoon sun. Something about biking home after climbing or hiking or backpacking just feels right. Hard to explain, but it just seems to prolong and enrich the experience. There has been a time or two where I've just wanted to be home after hiking or climbing and find myself pedaling into a stiff headwind 10 miles from home wondering why exactly I thought it was a good idea, but on the whole it's something that I deeply enjoy and appreciate having the health, equipment and circumstances to be able to do fairly regularly and I don't take it for granted. Good to see you getting out and climbing Mark! Enjoyed reading the trip report! You got that idea from Alex Honnold and Cedar Wright(Sufferfest http://www.climbing.com/video/the-suffe ... ull-movie/) didn't you? Ironically Ben Sollee introduced me to the Xtracycle with his Ditch the Van Tour a few years ago. Since then I converted my 1994 Cannondale mountain bike into an X. I've sought out ways to combine cycling with other activities. Since I used to be a climber it only made sense to consider biking to climbing areas near home. The cargo bike makes it easy to carry a climbing pack around. 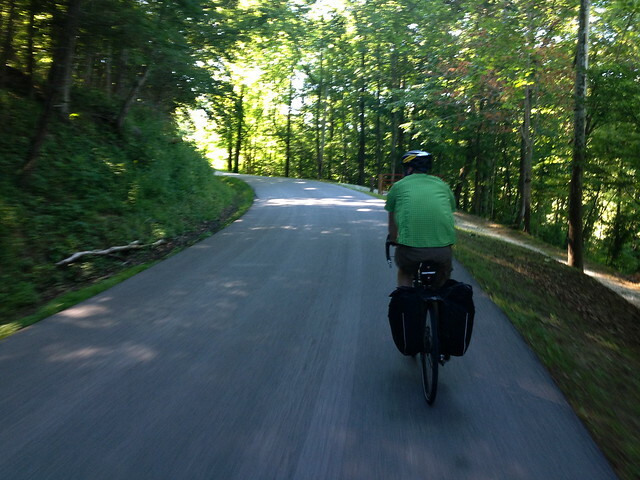 Mark had his panniers. It was really a no brainer. Then the bum went off and moved to Montana. We never did get to do the Red River Gorge Pinnacle Tour we talked about: Majors, Minas Tirith, Jewel, Tower all in a day by bike. Maybe I'll just do them solo. Ascentionist wrote: Ironically Ben Sollee introduced me to the Xtracycle with his Ditch the Van Tour a few years ago. Since then I converted my 1994 Cannondale mountain bike into an X. I've sought out ways to combine cycling with other activities. 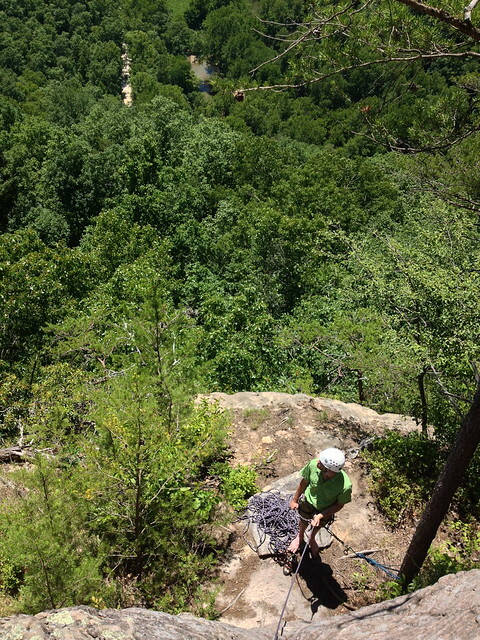 Since I used to be a climber it only made sense to consider biking to climbing areas near home. The cargo bike makes it easy to carry a climbing pack around. Mark had his panniers. It was really a no brainer. tell me more- one can adapt a mountain bike without serious welding? it's been years but at the time I was annoyed that I couldn't find panniers that converted to a backpack (much less readily hold a snowboard). also, thanks for the word on the sufferfest Redpoint, apparently I've been waay out of it. Inspiring! I have a B.O.B. bike trailer I use to haul coal to my PA house for the winter season but I'll bring it to KY in the spring to try a bike/climb tour. We did Full Moon, Fox Fire, Good Tang, Caver's, and Bedtime in one day, traveling by bicycle. We we're wanting to throw in Jewel but the river was up and supa cold. It was a super fun day. That's killer! When did you do that? clif wrote: tell me more- one can adapt a mountain bike without serious welding? I've had mine since 2011. You need some bike wrenching skills, but I'm nowhere near on the level of a bike shop mechanic and did my own conversion. They say the weight limit is 300lbs including rider. That's just so they don't get sued. I've hauled both of my kids and a week's groceries. I've hauled potting soil and four tomato plants. I've hauled a charcoal grill, "The" Mike of Mike's Hike and Bike, a wheelbarrow, chainsaws, all of my stuff when I left my Colorado office for the last time, climbing gear (still haven't figured out the best way to haul a crashpad), car parts, watermelons, other bikes, etc. If the Xtracycle is hard to find, cargo trailers are available including the B.O.B. which I've been using with my rigid frame MTB for ten years. It can easily haul a full climbing bag and more: biketrailershop.com/BOB-Ships-Free or rei.com/BOB-Bike-Trailers. They mount on the rear axle. The only drawback is the wheelbase is 3 feet longer so tight trails are pretty difficult to handle but getting to most all approach trails in the gorge should be no problem. My cargo bike is hard to find. There are still tons of options out there. The Surly Big Dummy is a great one for this type of thing. Also, you can probably find FreeRadical kits and/or full Xtracycles built on MTB frames through craigslist. There are good/great longtail cargo bikes out there. Years ago when FS 9 was closed I rode in two or three times to climb (once with a guided client) and used an InStep trailer (the kind you can buy at Walmart) with the top folded down and the packs strapped flat on top of the trailer. I BOB would be more efficient, but they run $300. 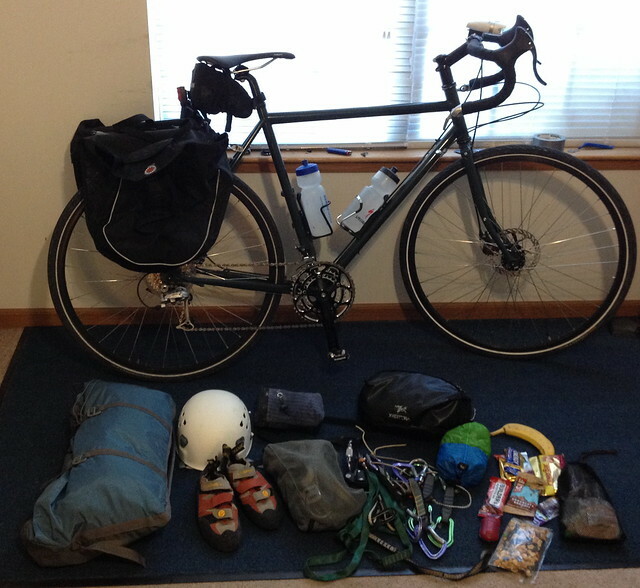 You could also use a standard commuter/touring bike with panniers with the gear stuffed in the bike bags and your empty climbing pack on your back and just load it at the trailhead. Pick a crag you can ride all the way to the wall and you wouldn't even do have to do that. That's a little more tricky though.